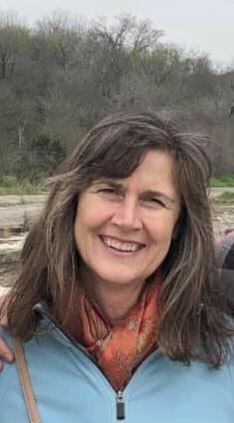 I've always loved chocolate and began exploring single-origin dark chocolate while I worked as a naturalist for the East Bay Regional Park District. The two big names in San Francisco-Bay Area chocolate -- Ghirrardelli and Guittard -- arrived with the California Gold Rush. 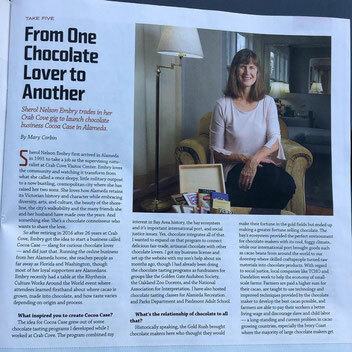 I'm excited to share my enthusiasm for the history and delicious variations found in chocolate grown and harvested around the world with you. Today there's an explosion of bean-to-bar chocolate makers in the Bay Area, as well as around the United States. Let's explore them together! Our chocolate makers work directly with the farmers from the world's finest cacao-growing regions to bring you the most extraordinary flavor profiles available anywhere - known as "bean-to-bar" in the chocolate industry. Most bars selected for you to taste are made with cacao from a single farm or region (single-origin). Fair trade practices ensure fair wages and better living conditions for the farmers and their workers. Purchasing from Cocoa Case ensures that your delicious chocolate experience is supporting fair and sustainable labor practices - never slavery! Our mailing and packaging materials are environmentally sustainable, recyclable or biodegradable. We curate a fine selection of chocolates for you each month allowing you to sample, savor, and compare fine chocolates at your leisure. Our flavor guide helps you to track your experience and your favorite bars. Indulge your senses with a new selection each month. 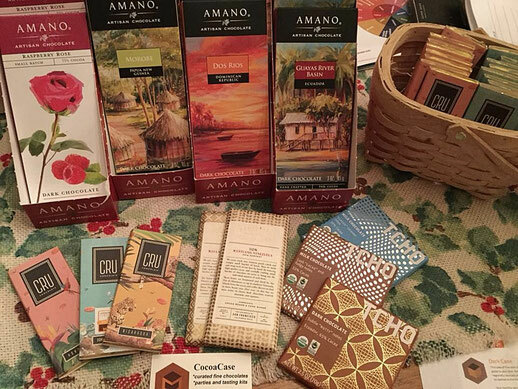 Our featured chocolate makers include Dandelion Chocolate (San Francisco, CA), Tcho Chocolate (Berkeley, CA), Cru Chocolate (Sacramento, CA), and Amano Chocolate (Utah) along with the Oakland Chocolate Company (Oakland, CA). We've added Letterpress Chocolate (Los Angeles, CA) and Castronovo Chocolate (Stuart, FL) and Manoa Chocolate (Oahu, HI) to our offerings.